I’m reading Bill Peet’s autobiography again (it’s like reading a kids’ story book). His autobiography is full of pictures, like his children’s books he wrote after he left Disney (where he was a storyman/storyboard artist/character designer). 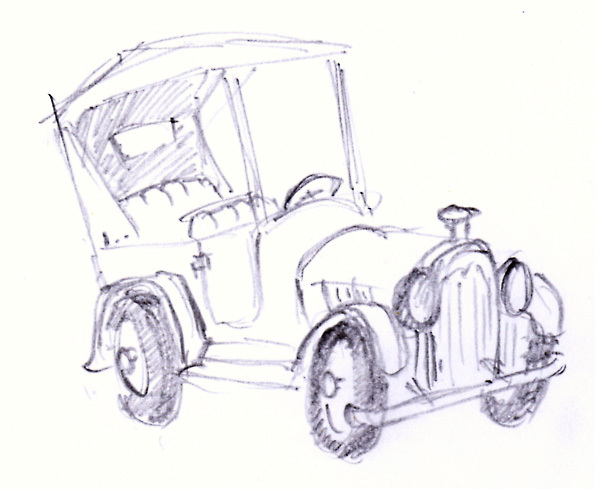 I also have some of his children’s books and I’m amazed at the simplicity of his art. But don’t let the simplicity of his work fool you. It takes a lot to pull off something that reads well and is simple. 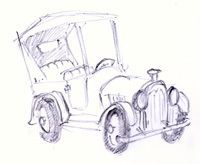 This car is my quick sketch of one of Peet’s automobiles in his autobiography. Certainly doesn’t do his version justice, but I’m trying to learn from him so it’s a start. Thanks for dropping by!